1.We had an amazing Christmas party. 2.The Liberty Science Center is a whole lot of fun when there is no one around. 3.The kids faith in Santa was re-instilled. BS got her toy which changes hair color only it needs icy cold water to do that and I am unable to provide icy cold water in this icy cold weather. LS got her "geef",a Thomas engine and couple of books. 4. "Pippi Longstocking" and "Katie Kazoo" are some new series that I got for BS. 3.I must edit my last post to add that Sheela and Munni are now the mainstays of Bong parties. So move over Ms.Lahiri. 4.Indian Chinese for Christmas works perfect. 5.We have been snowed in and housebound for the last 3 days and I wish Santa had gotten me a gift, a transmogrifer. 6.I saw "Up" after every one in the world has seen and said everything about it. 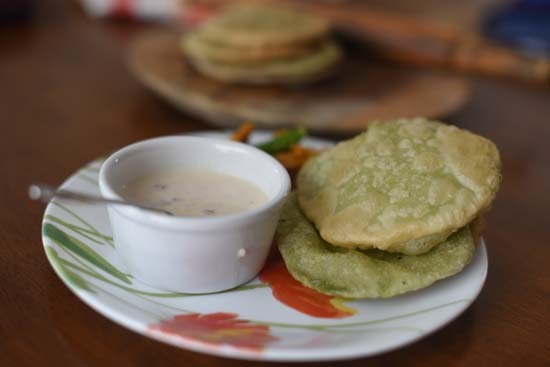 7.Teen kona parota or Bengali Triangular Parotas are not all that difficult and can be made without the aid of a compass and protractor. 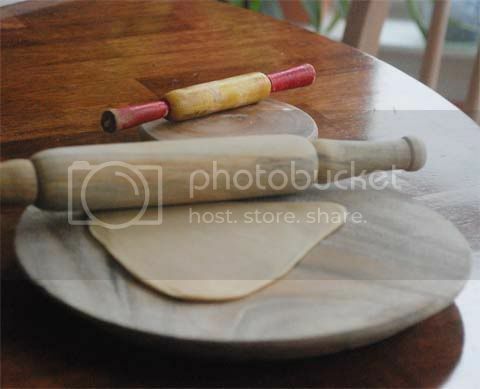 I say Bengali because I have not seen Triangular Parathas in any of my non-Bong friend's house. I have been so afraid of making the standard Bengali Triangle Parota all my life that I never ever attempted them. I would wait patiently for the Ma or Ma-in-law to turn up and serve them. I had such a mind block that I never even stood beside them while they rolled out the perfect isosceles triangles. And geometry wasn't even my weak point. Honestly, I wasn't even sure why they were better than the circular ones and I thought it was just a lot of hype. My doubt still continues. Then everything changed on a sunny November Sunday morning, when I told a friend staying the weekend with us, "Chal Parota banai"(Let's make Parota). Timidly I asked her if she knew to make triangular Parotas. She pooh-poohed the whole thing, saying it was no big deal and showed me how. While she expertly made 10 of them in 5 minutes, I struggled with two but at least I got some bell like shape out of it. There after I got into the groove and made them again. They now looked better. 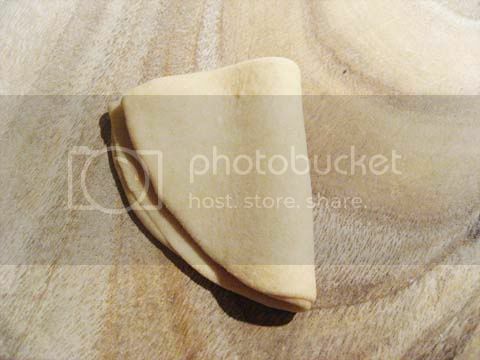 After some more attempts I can now say, Triangle Parotas are easy to make. Why they are important I cannot tell. You guys have a great next year. Make your resolutions and stick by them. When making teen kona parota is the high point of my life, it is natural that I resolve to do nothing better. White Oil for shortening ~ 1&1/2 tbsp. many people use ghee as shortening too. Warm Water ~ 1 cup(added gradually). Some people add warm milk to make a softer dough, I haven't, you can try. 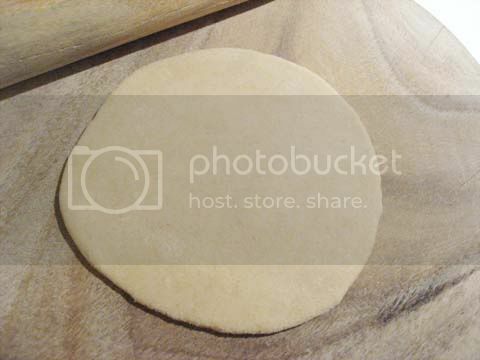 Dry Flour ~ in a plate for rolling the Paratha. In a wide mouthed bowl add the flour, the salt and the oil for shortening. With your finger tips rub in the oil into the flour. Now gradually add the warm water working the flour into a dough. If it becomes too watery don't panic and add a smattering of flour but it is smart to be cautious with the water. Knead the dough till it does not stick to your fingers at all. 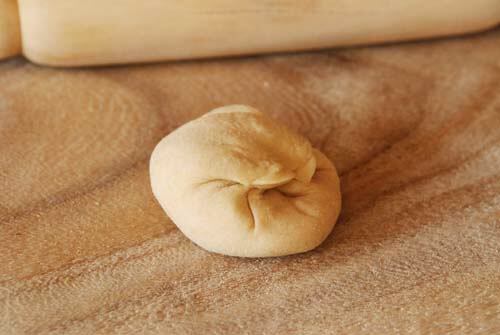 Keep on kneading till the dough becomes alabaster smooth, soft and pliable. 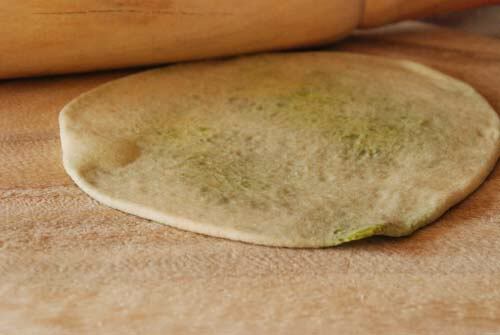 Cover with a damp cloth or damp kitchen towel and let it rest for 15-20 minutes. 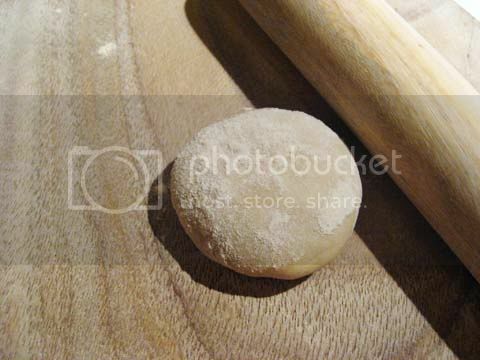 Once again pummel/knead the dough and make small ping-pong sized balls from it. Take a ping-pong size ball, flatten it between your palms, dust with flour. Roll some more, maintaining the shape. Thickness should be like the regular paratha. Heat a skillet/tawa. 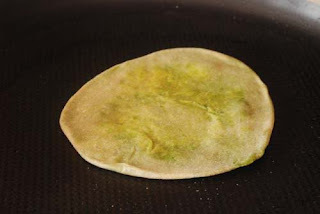 Place the rolled paratha on the heated tawa and cook on one side until bubbles starts to appear. 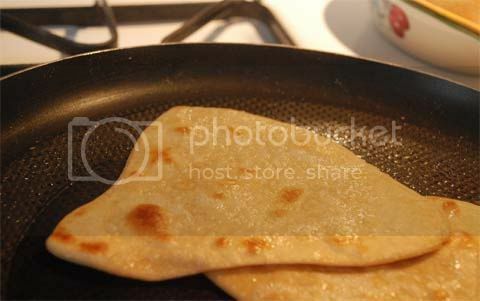 Flip the other side and pour oil in drops around the edges of the paratha or spray the surface with cooking oil. After half a minute or so flip again and again add oil around the edges. Keep doing this, every side half a minute or so until the paratha is cooked on bot sides. There will be little brown spots on the surface and then you know you are done. Peel and chop 3 medium sized potatoes in 2" long pieces. Add 1 to 1&1/2 cups of water. We have too many parties during the holidays. By too many, I mean "two", but that is many by my standards. And by parties I do not mean the sequined slips, pointed stilettos,dancing in smoky room kind of parties. That would be cool and I could have then put up pics of such dos on FB but I am never invited to such parties and I don't even have a personal account on FB or a sequined slip for that matter. No, ours is very un-snazzy Jhumpa Lahiri-ish Bong party. The kind where the kids play in the basement, the female folks gravitate around the kitchen and family room, the men folk drink wine and discuss Sodepur vs Obama and umpteen trays of food warm in the oven. I would say "desi" but there is a difference. "Desi" parties have games, lots of them. Till date, I have been forced to identify 20 pictures of unknown buildings and memorize 10 random objects on a tray, two of which were safety pins, all while I waited for the hostess to serve Dahi Vada. The husband was once asked to put a bindi on my forehead, blindfolded. He fled.We are yet to return the hostess's dupatta, the one used as blindfold. Bong parties have no such pressure.No showcasing of talent is necessary.No one is expected to do anything except eat, lots of it. You can get by without saying a single word other than, "Chop ta darun hoyeche(The chop is delicious)" or "Doi ta byapok(Yogurt is great)" and still be re-invited. Ask the Husband.He is the king of no liners. I love games though, especially dumb charade. Maybe I will return the dupatta next week and see if I can get back in. 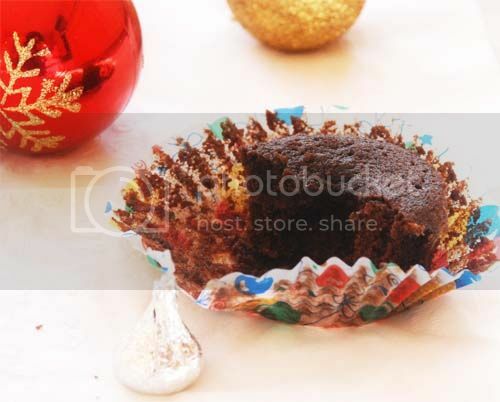 Yesterday night BS & I baked some Chocolate cup cakes for our Christmas Party.Our very own. It is what some of us close friends throw together to provide the kids some entertainment and a Santa. Gifts bought by parents are distributed, kids play games, sing songs, play the piano and then everyone eats food.An immature attempt to warm up an otherwise cold Christmas Night. The kids might actually cringe at the thought of such parties in their adolescence but we like to think otherwise. Now to these chocolate cup cakes which are hands down better than anything ever. Every chocolate cake is but these are rich, moist, chocolate-y and perfect. BS has loved them earlier and of all the things I have baked so far this and the Chocolate brownies are her only favorites. My search for the perfect chocolate cup cake recipe came to a stop once I found these and I have already baked them a couple of times. I love chocolate cakes with a gooey center but wasn't brave enough to do the mousse filling. 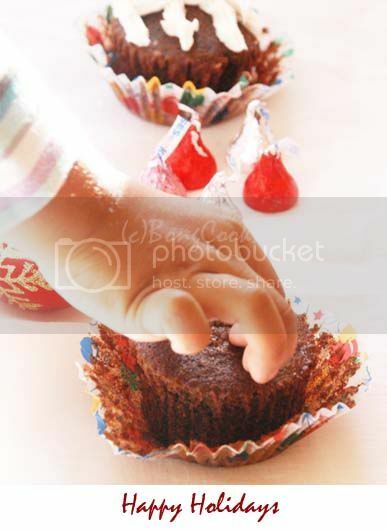 So I put a single Hershey Kiss at the center of each of the cup cakes and baked them. The result was not exactly a gooey center but a slightly soft, more chocolate center. The next time I will put in half of a Lindt truffle and see how that works. These cakes are pretty rich and perfect sweet by themselves but for some I did a nutellaa frosting just because I had a Nutella jar itching to be opened.and for some BS did a icing just because she loves doing those. Also since these are pretty rich, I think it is better to do mini cupcakes instead of 16 regular ones. That way you can indulge without guilt. 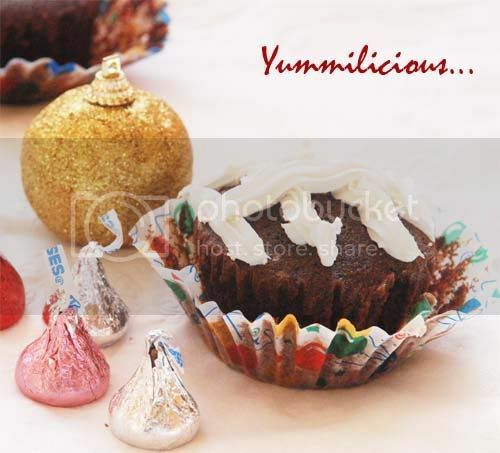 These go to Nupur's Holiday Buffet and thanks Stef of Cupcake Project for the awesome original recipe. And we have already demolished 4 of the 16 cupcakes.If at least 12 survive for the 14 kids coming tomorrow, hail Santa. BS also plans to play " I want a Hippopotamus..." tomorrow. If we survive the hardly rehearsed rendition, we will have a Happy Holiday. You have one too. Kiss for each cup cake, 16 sweet kisses. Add sugar and beat until light and fluffy. Check my post to understand how much to beat. cocoa powder into a small sized bowl and whisk to combine. In a cup add the milk and vanilla and stir to combine. 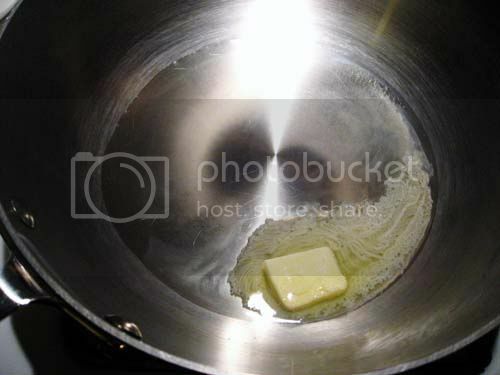 Add about a third of the dry ingredients to the butter/sugar and beat to combine. Add about a half of the milk/vanilla and beat to combine. Beat gently, I mostly do this with my rubber spatula. Continue adding, alternating between dry and wet and finishing with the dry. Stir in chocolate chips. I did not do this, instead I added a Hershey kiss to each of the cups. Bake at 350F for 20-22 minutes or until a toothpick comes out clean. Mine were done at 18 mins. Frost or ice or decorate according to your wish. If you want to create yummy chocolate cupcakes like this one, pastry schools offer classes on baking and pastry arts. I really really love December. Though the month brings lots of housework, cooking, cleaning, re-cleaning, making umpteen trips to the grocery store on cold cold days, I still love it. I don't do too many Christmas presents so am saved running around in the madding crowd of department stores. Though BS & LS don't really have a wish list for Santa, I still have to buy something for them, to keep with the spirits and put stuff under the tree. LS said all she wanted from Santa was "Geefs" and Santa was going to give "geefs" to her and Didi only. "Tomay Santa geef debe na. Ami debo, bujhecho? (Santa won't give you geefs. I will, understand ? )", she told me. BS initially wanted a pair of light up shoes, a simple pair which looks horrible and does nothing but light up. Her Dad had denied her that and got a pair of sensible sneakers instead so she said though Santa wasn't really real but only some saint, she wanted the light up pair from him. Last Friday though she said if she had a wish list she would put on it a Polly Pocket doll that changes hair color on getting wet. For all I know she might forget about both by Christmas Day. December being her birthday month, she gets enough gifts to keep her happy anyway. 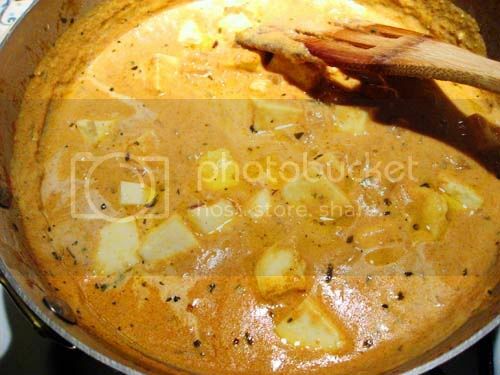 Now to the Paneer Butter Masala/Paneer Makhani which I made for a party this weekend.It was genuinely loved. Honestly I am not a Butter Paneer kind of gal. Though you might not know it. You might see me and think, "Oh she sure eats Butter Paneer for all three meals a day". But that is not really true. I hardly make butter paneer or butter chicken and don't crave for them even at the grand Indian buffet. Now buttered toast with some sprinkled sugar or salt & pepper is something I crave but we shall not digress. The smooth, uniform taste of the makhani gravy does not excite me.But I have learned that people love Butter paneer or Butter Chicken or Butter Mutter or at least they think they love it. They will cross continents and open a shop and sell an orange gravy called Utter Butter and next day there will be a queue outside asking for more. It doesn't hurt that it is god dang easy to make. Much easier than shukto or bandhakopi ghonto or such stuff. Even if something goes wrong all you have to do is add more butter and cream and voila, there is praise all around. I used to make a low fat version of Butter Chicken earlier and still do but when I have lots of people over I go overboard and do the whole butter, cream thing. People apparently love butter. So be it. in a skillet till fragrant. Alternately pop in toaster oven for 5 mins at 250F. Cool and grind to a fine powder. Store in a small air-tight jar. 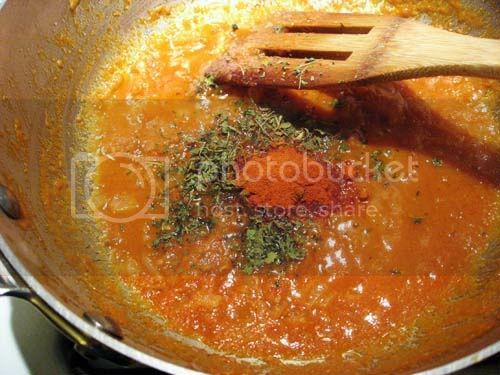 Use 1-2 tsp of this Garam masala in the gravy. To the oil add approx. 2 cups of red onion finely chopped and fry till onion starts browning. 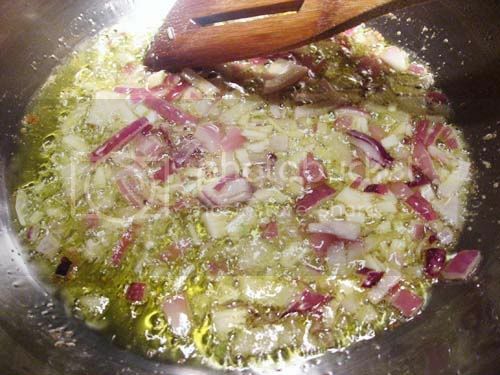 If you like your gravy very smooth with no onion pieces to bite into, you can do a paste of the onions or fry the onions and then make a paste too.Note: I have made this with just about 1 cup of chopped onion and that works very well too. Puree fresh or canned tomatoes to make about 2 cups of tomato puree. 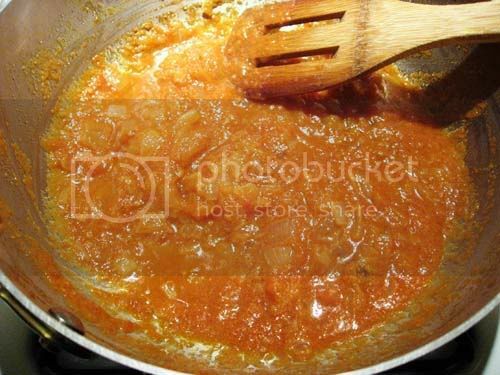 Add the Tomato Puree to above and fry for 8-10 minutes till water almost evaporates. 1 tsp of Garam Masala Powder. 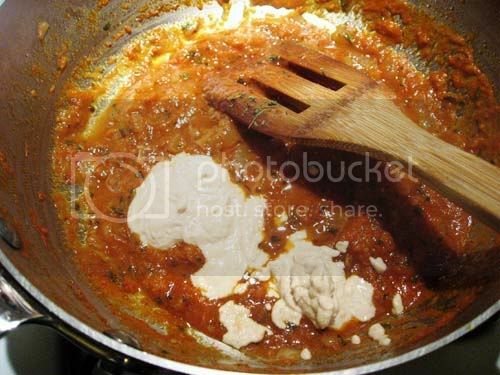 Fry till the raw smell of tomato is gone and you see oil separating from the Masala. This will take some time but it is important that you achieve this step. Add 1 cup can(14 oz) of Evaporated Milk and 1/2 cup of water. Add salt to taste. I will also add a little sugar at this point.Let the gravy come to a boil and then let it simmer at low heat till it thickens a little. You can cool and refrigerate this gravy and use it in a couple of days. Note: Cham in one of her comments had suggested that if I am weary of cream I could use Evaporated Milk for the gravy. That is what I do and only add a little cream at the end.It tastes perfect. Cut a 14oz/400gm block of Paneer in small cubes. I use the Nanak Brand we get here which arguably is the best. If the Paneer is of the tough kind you need to soak in warm salted water after frying. I do not do that with nanak brand.Edited to Add: I do not use all the paneers from the block in this gravy, maybe 3/4th of the cubes is used. The other paneer cubes are refrigerated for future use. When you are ready to make the paneer fry the paneer cubes to light golden. While frying, I sprinkle a little salt, sugar and kasoori methi on the cubes.Add the paneer pieces to the gravy. Add a little more water or milk to make the gravy right consistency. Adjust for seasonings and add a little more Garam Masala if needed. Add 2-3tbsp of cream and let the gravy simmer for 10-15 minutes till done. It tastes good even without the cream but what is butter paneer without some heavy cream anyway. Today I will not talk much and we will have a peas-ful time. Koraishuti|Motorshuti| Sweet peas, whatever you call ya, has sweet, nostalgic ties to our Indian childhood. It was a coveted vegetable that made its appearance in our childhood sabji markets only during winter. Since it stayed around for only a couple of months, it was much adored and cherished, just like anything else that is not routine or regular in our life. But today there will be no nostalgia about shelling green peas by the mounds on winter evenings watching Chitrahar on DD1. No fond remembrance of the waxy pea pods and their sweet pea smell.Not a word about how the pea pods would taste in a jhol Ma would make. 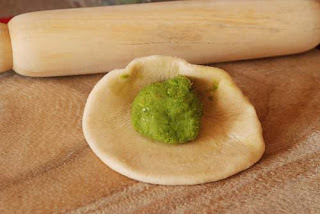 I could have lapsed into sweet memories of my Dida making koraishuti'r kochuri and us huddled in the pantry below the stairs, shelling peas, popping a couple of peas from each pod, laughing and the mound of peas growing much smaller than the mound of gathering pods. But I will not speak thus because I did not shell a single this Friday night. I used my pack of frozen Birds Eye peas in the freezer. I lost out on the bonding over peas but on a Friday night when all I wanted to do is fix dinner and conk off, the shelled sweet peas worked more than fine. And also let me clarify, I did not make Koraishuti'r kochuri. No, I made Koraishutir Parota. Not much difference except for a gallon of oil here and there. Not that a gallon more matters when it's the season to be merry. But I had just consumed pounds of butter a week back and did not think following up with a gallon of oil would be judicious.So Koraishuti'r Parota it was. 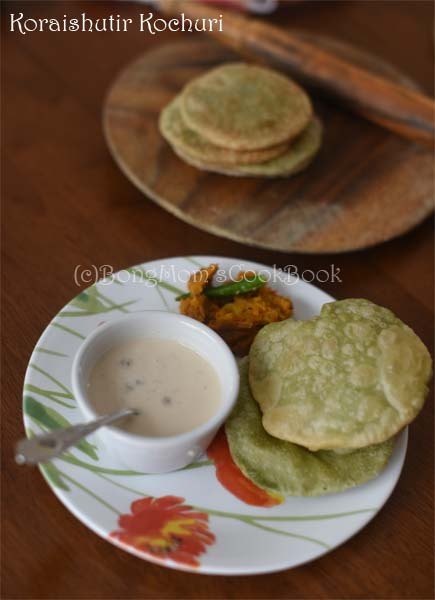 Updated on Dec 30th 2017: This post has been updated with the Koraishutir Kochuri recipe which I made again today. I have realized a gallon of oil does not a difference make when serious stuff like Kochuri is around. So if you scroll down you will get the Kochuri recipe!!! So towards this venture let's first make the Pur or the stuffing made with peas only. It is easy and quick if you have a freezer and peas in them. The stuffing remains same if you make Kochuri or Parota. This makes stuffing just enough for 8 Parotas or 12-14 Kochuris. Take into consideration that if you are like me, you will eat the stuffing just like that too. Defrost 2 cup of frozen sweet peas. I usually prefer the Microwave for such purpose. Add a pinch of Hing/Asafoetida. I will insist on this as it lends an awesome fragrance. 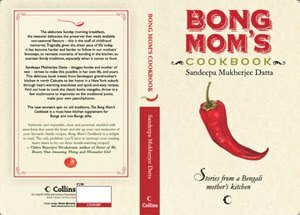 Many Bengali homes will add a little whole cumin instead of Hing, but I will steadfastly stand by Hing. I sometimes do the tadka with cumin + Hing. Add the pea paste that you just made. Sprinkle 1 tsp of Dry Roasted Cumin + Red Chilli Powder(Bhaja Moshla). Add salt to taste. If your peas are not sweet enough add a little sugar. If you like it hot add some Red Chili Powder. Improvise. 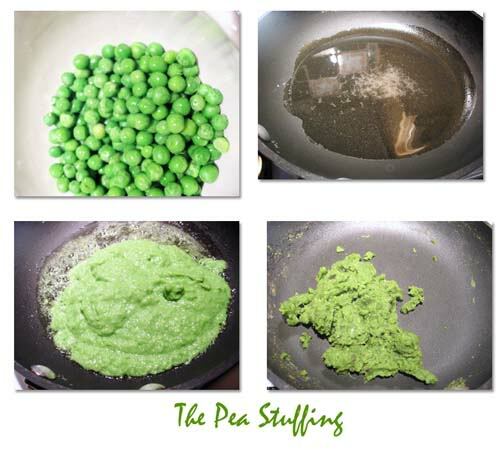 Now keep stirring till the water from the pea mix totally evaporates and the mixture becomes dry, thicker and congeals like in 4th picture anti-clockwise. This takes a good 15-20 minutes or more. Basically it should come to a stage where you can make a small ball for the stuffing. The following measure makes more Parathas than the stuffing I made. 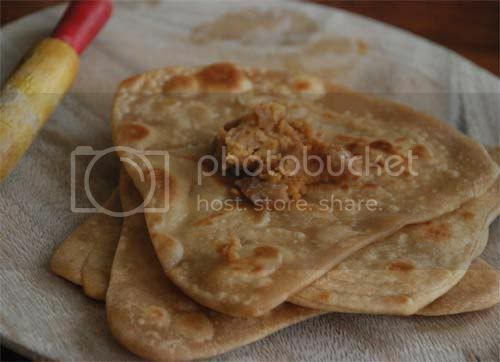 Since I make smaller sized Parathas this measure gave me about 14 small parotas. 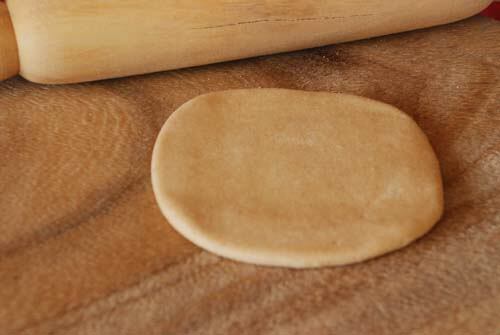 Now pinch the dough to cover up the opening and flatten it out on the palm of your hand. 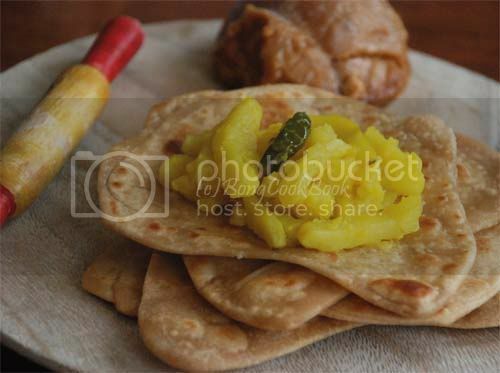 Flip the other side and pour oil in drops around the edges of the paratha. Once again pummel/knead the dough and make small ping-pong sized balls from it. For Kochuri make smaller sized balls. Now to roll out, follow same steps as the Parota. 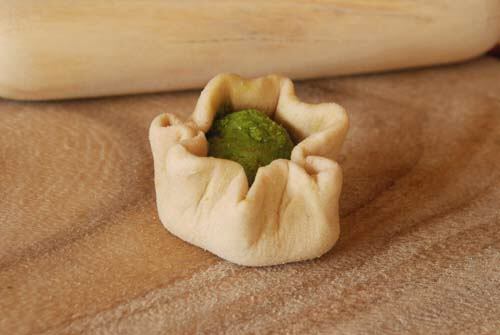 Kachuri is deep fried and smaller in size so make smaller discs. Put stuffing and roll just like above only a bit thinner. 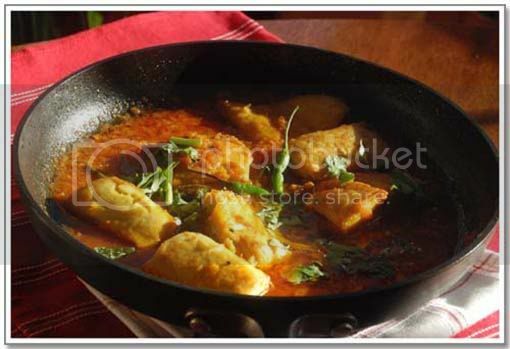 Now heat oil in a wok/kadhai and deep fry the kochuri till both sides puff up. 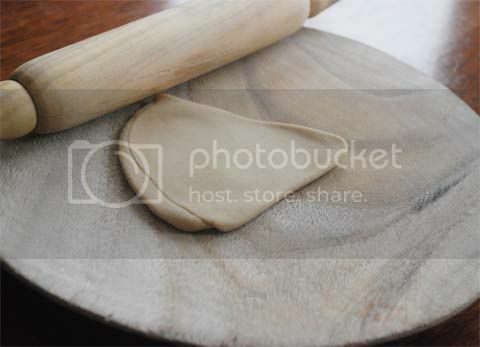 This process is more like making luchi which I have here and here. 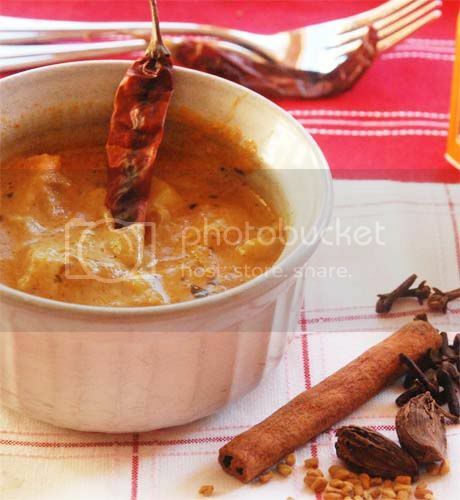 Enjoy these with some Alur Dom or Cholar Dal or just by themselves. 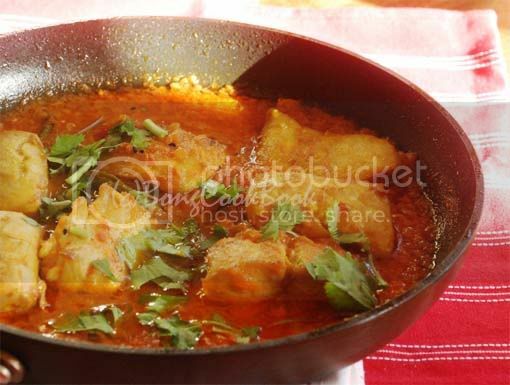 Come Winter, I start recollecting the exact way this light fish curry with tomatoes would taste. It is not that I make it only in Winter. No, it is an easy dish and I make it throughout the year whenever I have less time on hand which apparently translates to often. But never do I think deeply about it as I do, when the mercury drops and I seek out a patch of sunlight sliding through the high windows of my family room. Years ago winter meant sunshine on your back, a sunshine that warmed you unlike the folly outside my window. It also meant lots of fresh plump red tomatoes, their skin smooth and taut as a baby's bottom and green coriander leaves, dhone pata, with a smell that reminded you of green fields stretched out luxuriously in the winter sun. Ok, I am not really sure if they reminded anyone of anything but food but that statement sounds pretty nice so that is how it will be written. It also meant mid-terms or half-yearly as we called them.Coming home early, dusty and tired after half a day of writing about meaning less things on a sheaf of paper, right in time when Ma would be serving lunch. On such days, this light fish curry with the fresh tomatoes was what I most looked forward to. 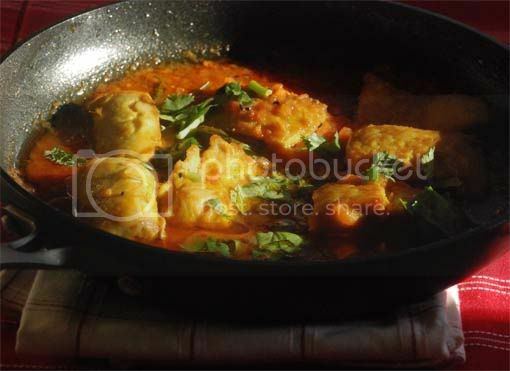 Made with Rui(Rohu) or some fresh Chara Pona, this halka jhol solely relied on the tomatoes and the fish to impart the right taste. With some fluffy white rice, this would be the only bright spot on a day that would be later spent ruthlessly memorizing the details of Panipat War. Better days of December would soon follow and there would be rich fruit cakes, pastries from Flury's, juicy Darjeeling oranges made into kamola kheer, but this macher jhol would still hold its place and would whisper "home" while we made a pledge to survive on only rum balls the entire life. In the US, if you have access to an Asian Market, I would insist you get fresh fish like Striped Bass or Buffalo Carp cut in steak sized pieces from there. They taste awesome in this gravy. Even Pomfret or Butterfish from there will work well. Rohu from your Bangladeshi Fish seller works very well too. If everything fails try with fillet of Tilapia or Rainbow Trout. Never, ever make this dish with Mahi Mahi like I did this Sunday. It took away all the taste of the dish. Also no Salmon. Sweet water fish works best for this kind of light gravy. I blogged about exactly this dish in October when I just started blogging way back. Things don't change that much foodwise. Serves 3 adults. About 6-8 pieces of 2" x 3" fish pieces. Heat Mustard Oil in a Kadai/Wok till you see smoke just coming out, indicating it's hot enough. Fry the fish in hot oil till it turns light golden on both sides, kind of deep fry. 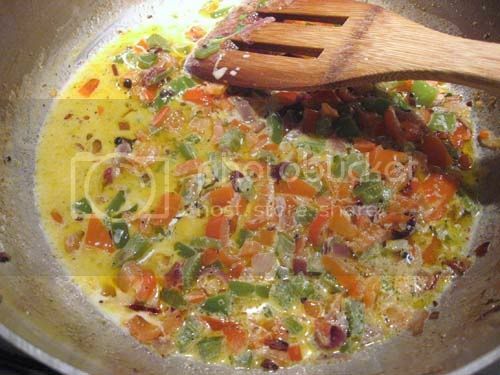 The only draw back of this is most of the oil goes to waste as you discard most of the oil after frying. You can also save this oil for frying fish again next day as my Ma would do. If you are using fillet of fish you can shallow fry them in much less oil. Heat Mustard oil to smoking in Kadai/Wok. 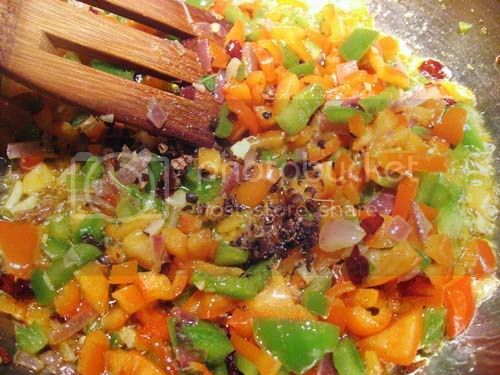 Temper the hot oil with a little less than 1/2 tsp of Kalonji/ Kalo Jeera and 4-5 hot Indian green chillies slit through the center. Puree or finely chop two medium tomatoes of good quality. I used about 1 cup of fresh tomato puree. Saute till they become a fine pulp, kind of mushy and you see the oil seeping out on the edges. The raw tomato-ey smell should be totally gone. Now add a pinch of turmeric powderr and 1 cup of water. Add salt to taste. 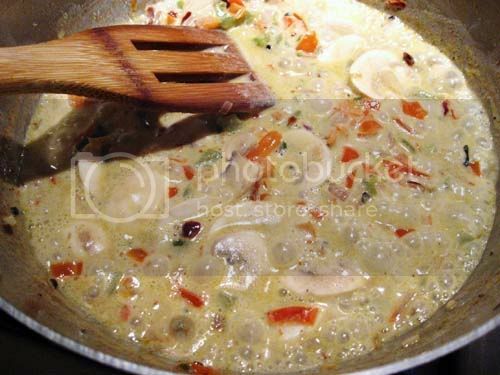 Simmer till the gravy comes to a boil.When the gravy comes to a boil add the fish pieces. Add a fistful of fresh chopped coriander leaves. Cook for a few more minutes and you are done. The gravy is light and is best enjoyed with white rice. Because it is December and we are in the Northern Hemisphere where December == Cold Winter, I have decided to crank up the oven on Friday nights to give us the much needed warmth. This will also help me work on my non-existent baking skills. My goals aren't lofty. 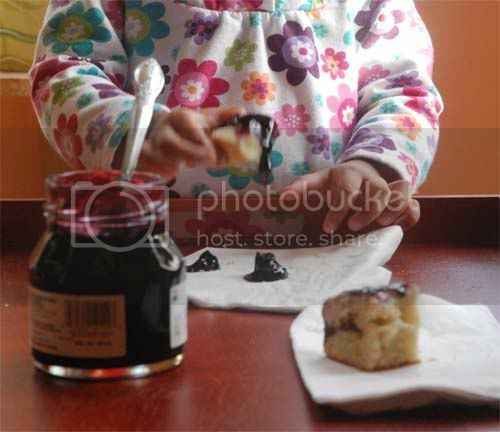 I just want to bake something decent that BS and LS might love and their children might enjoy and 200 years later the family fondly remember Great Grandma Bong Mom's Pound Cake while beating eggs 300 strokes by hand. Ahem. So far, BS loves the Chocolate Brownies and the Better Than ... Chocolate Cup Cakes. I haven't told her the name and yet she loves them. They are really rich and chocolate-y. Before Thanksgiving I made the Zebra Cake which looked really nice with the zebra patterns. But it was a little less sweet and not very rich in texture. Me & D liked it because it was less sweet and more bread than cake like. BS didn't really show much enthusiasm. Now honestly BS's showing or not showing enthusiasm does not mean much except a snub on my "I am the best" feeling. She could have ga-ga'ed over the same cake if it was at her best friend's house and might even come back and eat this two months later. You never know. 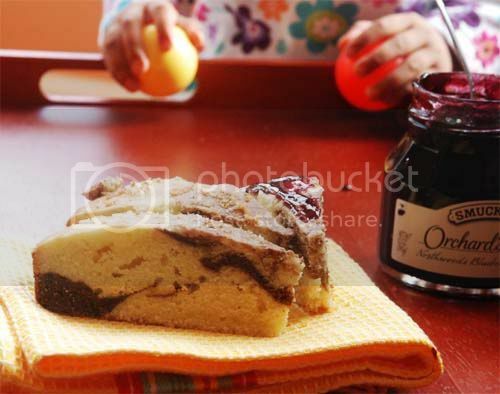 Last Friday, my project was Chocolate Marble Pound Cake from Sailaja's Kitchen. Pound Cakes have loads of butter but since it is December, I said ok and went ahead. While baking I am trying to understand the science that goes behind all that creaming and beating and it would be really nice if I could experiment more and flush the product down anywhere but my throat till I get the perfect cake. This particular cake was rich and dense. When had the next day it needed to be nuked for 10 secs to get the moist taste.Also the batter was thicker and more spreadable than pourable. That I learned was not a source of panic but the norm for pound cakes. Really ? Is that true ? I also needed 1/4 cup more milk than the recipe asked for to make the batter moist. 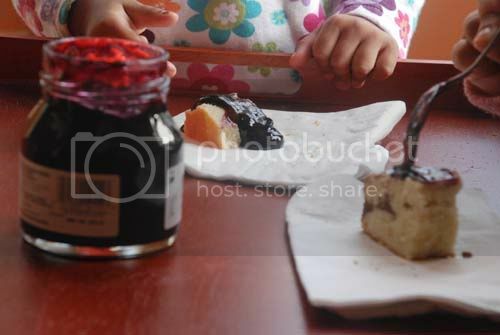 The cake again was a little less sweet for the kid's liking but they enjoyed it with some preserves. Since I am trying to find meaning in this madness of baking, I will have my two cents on baking science right here. None of them are my theories, they have been sourced from here, here and here. Most buttery Pound Cakes start with a step called creaming. What happens when you cream butter and sugar ? What's the fuss all about ? How to add eggs ? Eggs should be at room temperature before they are added to the butter-sugar. Never happens with me, I will put them in luke warm water for 5 mins and proceed. Ok, maybe I SHOULD bring them to room temp. Add eggs one at a time to the creamed butter and sugar and beat. Now Alton Brown says, adding eggs one at a time is silly. It must be. Anything one at a time sounds silly to me. Just dump all together and get it over with, I say. It is better to mix the eggs together first so that the water in the egg whites can hook up with the emulsifiers in the yolks. Did that even make sense ? Whatever. Now this is easy to understand.The eggs adds more volume and allows the mixture to hold even more air. Beat until the mix is smooth, light in color and the volume has increased to look fluffy. The texture of the cake is dense if the eggs are added whole and much lighter if the egg whites are beaten separately and then folded into the rest of the batter. 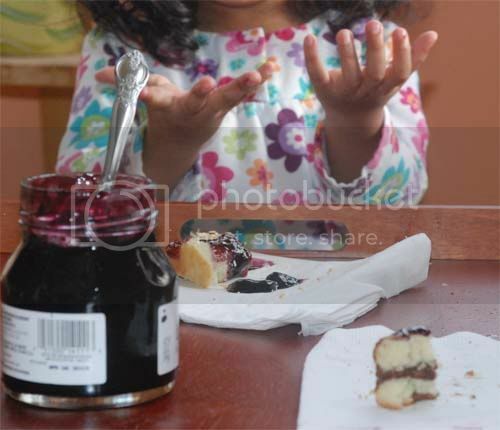 I want lots of that gooey purple stuff. Much more than Didi has. 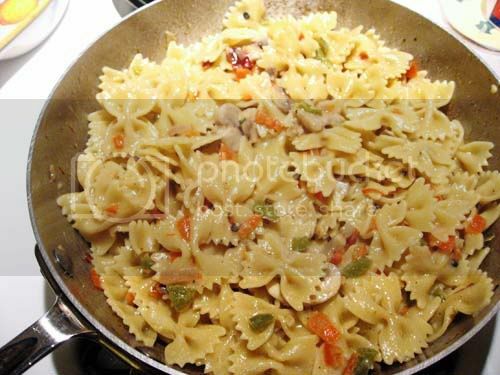 How to add the dry ingredients ? First sift all the dry ingredients, i.e. the flour, the baking soda or powder. Then add the dry ingreds first, usually alternating with liquid(which in this case was milk) till it is well blended. The protein in flour, the gluten is what makes the cake hold its shape but too much of it will make the cake tough.So do not overbeat as that will produce more gluten.When you start with the dry you cover the flour particles with fat and so water can't get to the flour and there won't be any gluten. This ensures a tender cake. Whoa !!! The baking soda or powder when comes in contact with liquid or when heated, releases carbon dioxide that forms bubble in the batter. So you get more air pockets or holes in the batter. This one thing is elementary science at least. What happens in the oven ? As the batter heats up in the oven, bubbles(remember air pockets formed during creaming) expand and the batter rises. As the carbon dioxide breaks down, the moisture in the cake forms steam, which fills the air pockets our sugar made. Eventually, the steam evaporates, but by this time the protein in the flour has had enough time to set, thus making the cake hold its shape. Just as heat makes steam and carbon dioxide expand, coolness causes contraction. So if you open the oven door before the cake is set, a draft will burst the tiny bubbles and the cake will fall. What is it about cake pans ? 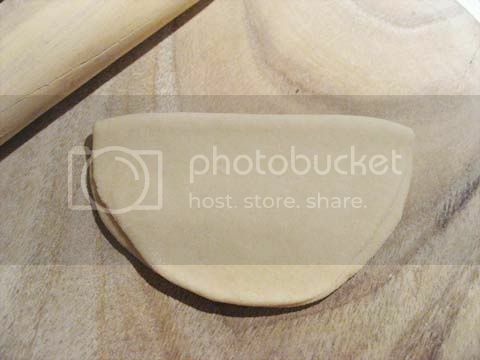 The size and shape of the cake pan plays an important role in baking. Apparently all cakes cannot be baked in all kinds of pans. Size and material does matter. Most cake recipes work well for cup cakes too. 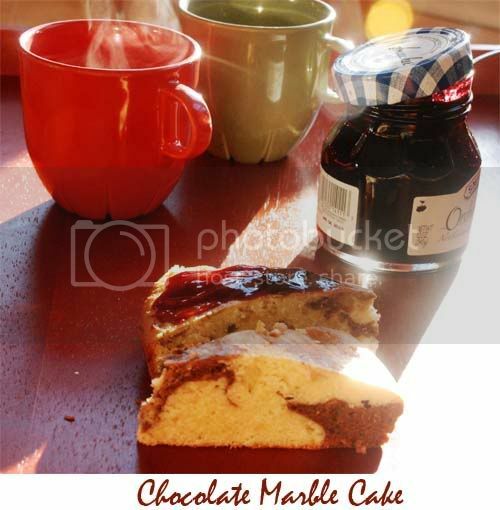 To make pound cake cup cakes try this. I am not eating any more of this stuff. I am done. Preheat oven to 350F. Grease and dust a 9" round pan with flour. With the aid of your mixer beat the butter. Add 1 cup of sugar gradually. Beat till sugar and butter mix is light in color and fluffy. Add the egg mix and 1 tsp Vanilla extract to the creamed butter and sugar and beat with your mixer(for 2-3 mins) till you get a smooth mix.You could also add eggs one at a time to the sugar-butter mix, beating for 30s -- 1 min each time. Now add 1/3 of the dry ingredients to above, gently mixing. Follow with a little of the milk. Continue this ending with the dry. 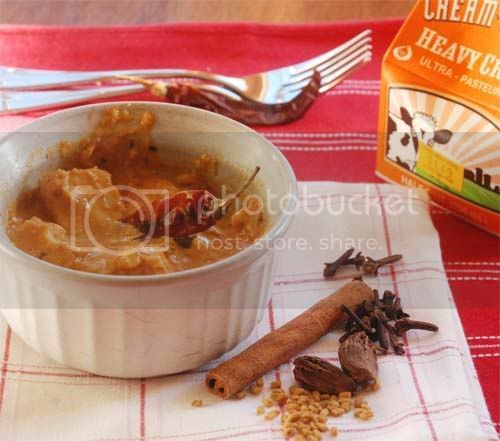 Remove a cup of this batter in a bowl and combine with 2 tbsp cocoa pwd. Mix it gently. My batter was thick and not easily pourable. Pour a tbsp of white colored batter into the greased and floured pan. Alternate with a tbsp of cocoa batter. Continue through out till both the batters are finished. Smooth out the top with a spatula. 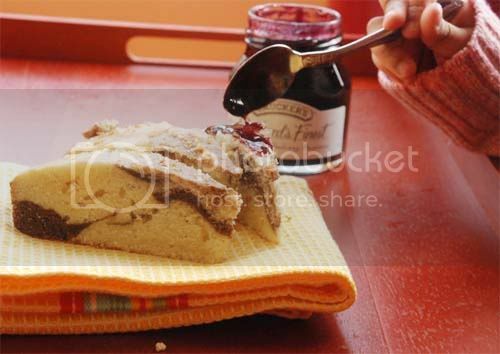 Take a knife and swirl it around the batter in a zig zag fashion, 3-4 times. Put in the oven and bake for 40-45 mins. Check with a toothpick to see if it is done. Take out of the oven and cool for 10 mins. I don't know about you but I love the Louisiana Style Chicken Pasta at Cheesecake Factory. I love it so much that it is the dish I always have when I am there. Not that I am there a lot. I mean I would love to be there always but they have this 40 minute waiting time and my kids are not really the waiting kinds and though I can wait till infinity to have that pasta, my kids have better things to do. Maybe I just have way too much time on hand. 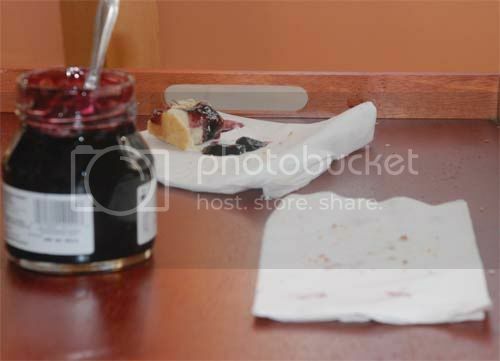 Maybe I should find myself better things to do.Like ordering a dessert next time I am there. This Pasta makes me so full that I always skip dessert. 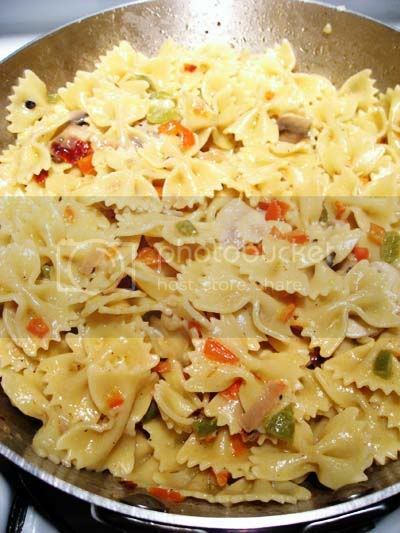 Or like googling for Louisiana style Chicken pasta instead of waiting for it. Taking matter into my own hands.Having my Pasta and eating it too. Not all kinds of pasta. But hey Louisiana, here I come. So this is the star recipe that came to my rescue. I will be eternally grateful to this lady for coming up with this thing and though I mangled her recipe and put my signature touches all over it, the credit goes only to her. Also I totally skipped the chicken part since there was none. I asked the other adult to get me some chicken breasts when I started cooking this, which is 9:15 PM yesterday night to be exact. But he ignored. I didn't even ask him to hunt for it, to just get it from the grocer's but he still ignored. Men just aren't the same anymore.They don't gather food, they just eat it. Heat 2 tbsp Olive Oil in a skillet. Recipe said 1 tbsp butter but you know me. 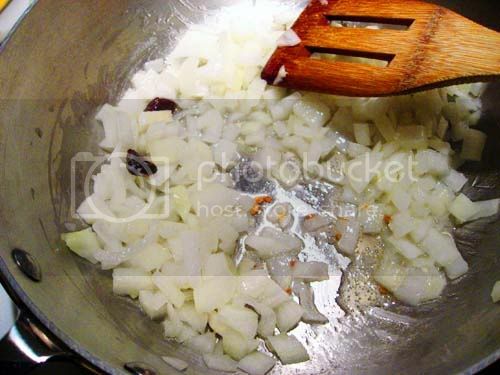 Chop 3/4 th of a small red onion in small pieces and add to skillet. 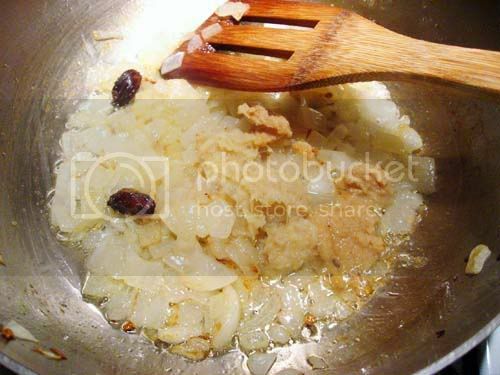 Follow suit with 2-3 cloves of garlic minced. 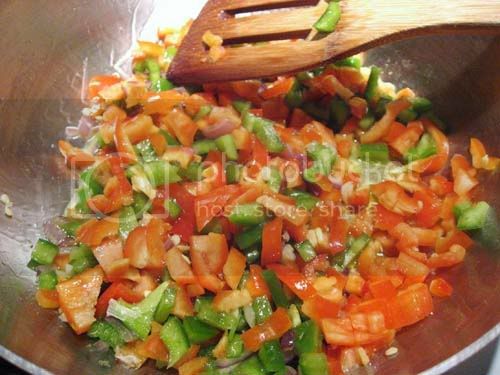 1/2 of a green bell pepper or 1 small yellow bell pepper chopped in small pieces. 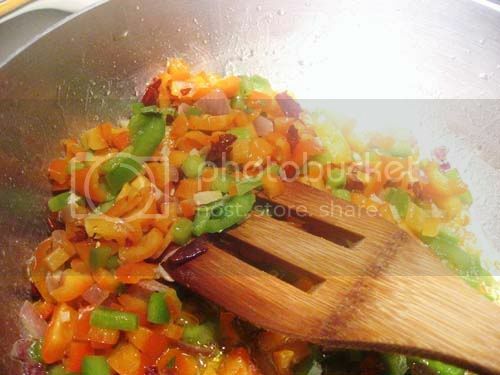 Saute for about 4-5 minutes till the veggies soften. 1 tsp crushed red pepper or 2 Dry red chili crushed. Adjust as needed and increase if you have no fear of red pepper. More spices. Since this was Cajun cooking D decided we need to skip Basil which the recipe had and add these spices instead. Again we did not have Basil and at 9:15 PM yesterday D ignored my plea to get basil from the grocer's so he came up with his theory about Louisiana people not using Basil and such. Simmer until it comes to a slow boil. Now cover and at medium heat let it simmer for 5 minutes or so till sauce thickens a little. Note: You need to add the cream as per the original recipe if you want a creamier sauce. I liked my low cal version though. Recipe said to add 4tbsp of Minced fresh basil which we skipped because no Basil @home. Add about 1 cup of grated Parmesan cheese to the sauce. Stir to mix. Check for seasonings and adjust salt and pepper. This is a must, the adjusting. Simmer sauce till it thickens. Should not be runny. 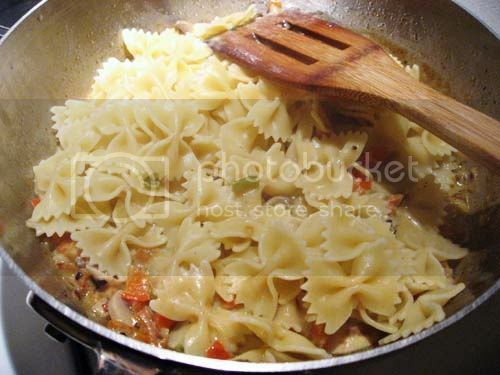 Drain and add pasta to the skillet tossing gently to mix the pasta with the sauce.I added the pasta gradually mixing to make sure that the sauce was enough to coat the pasta. 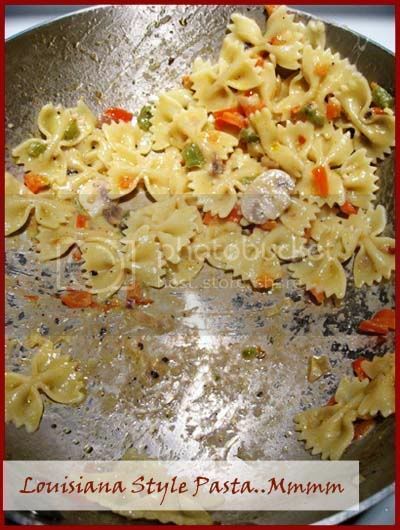 I did not use the whole box, about a cup of cooked pasta did not find its way into the sauce. The delicious Pasta is ready, sitting there hot and pretty. Eat it and fall in love. You deserve it. Maybe add some more grated Parmigiano. Life in December is all about good food. I will send this in to join Presto Pasta Night started by Ruth and hosted by Rachel at The Crispy Cook.